One of the leading electronics and gadget maker unveiled a new android tablet that features a 7-inch display with Intel quad-core processor and runs on the newest Android Kitkat OS, the Toshiba Excite Go. Powered by Quadcore Intel Atom CPU, the Excite Go, has a 7-inch display with a resolution of 1024x600. It has a 16GB internal storage that can be expand up to 128GB via SDXC cards. 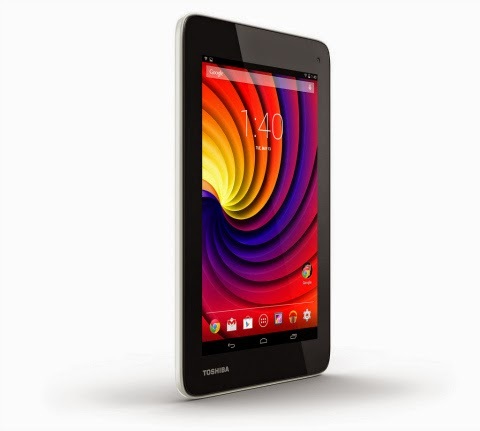 Toshiba provide a battery in the new tablet that last up to 8 hours of general use or up to 6.5 hours of video playback. The Excite Go will be available in the U.S. beginning early July with a $109.99 price tag.